SteamVR has 2 versions which each serve a special purpose. The primary release of SteamVR undergoes an extra level of testing and verification in order to ensure stability and robustness. As Valve develops new features for SteamVR, they deliver these first to a different Beta version. The Beta version is generally very stable as well but it is the version where new features are incubated and tested in the field. What this means is that in terms of features, SteamVR Beta ill always incorporate the latest innovations (and bug fixes) while the main version will lag the Beta version as new features solidify. 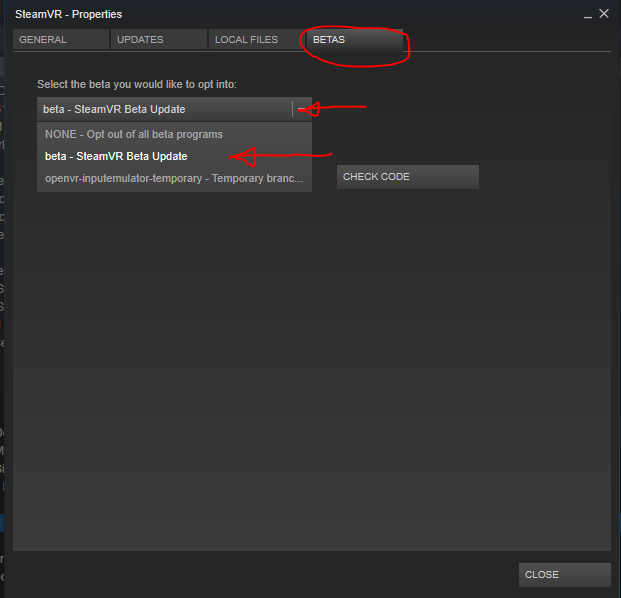 Right Click on SteamVR and select "Properties"
5) Select the "BETAS" tab and use the drop down menu to opt into the beta version. 7) Use this same process selecting "NONE" if you would like to stop using the Beta version. Note: Periodically other branches of SteamVR will appear in this drop down. Often these branches for other trade shows (like CES) or large feature changes which require some Beta Features but not necessarily be tied to other unrelated changes occurring in Beta. In general, Do Not use these branches unless you know exactly what you are doing.